Although the hype surrounding Wednesday, June 21 was centered around the Vegas expansion draft, the evening was also dedicated to the NHL Awards. Hockey fans eagerly awaited the announcements for popular awards such as the Hart Trophy, which goes to the league’s most valuable player, and the Calder Trophy, which is awarded to the top rookie, but there are other lesser-known awards as well. The Masterton Trophy is awarded to the player who best exemplifies perseverance, sportsmanship, and dedication to hockey. Last season, the award went to Jaromir Jagr, who at the age of 44 lead the Florida Panthers in points with 66, becoming the oldest player to surpass 60 points. Each team selects one player to nominate for the Masterton Trophy. 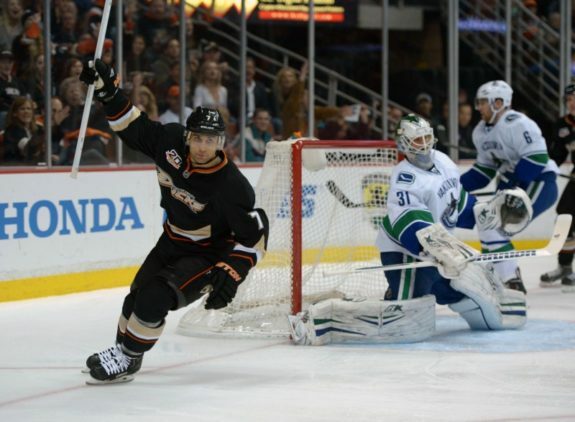 For the Anaheim Ducks, their nominee for the fourth time was 30-year-old forward Andrew Cogliano. This year, for the first time, Cogliano was a finalist for the award. As impossible as it seems, Cogliano has never missed a game in his decade-long career, a feat that has earned him a spot on one of hockey’s most exclusive 500 lists. Through the conclusion of the 2016-17 season, only 24 players have participated in 500 consecutive games. Cogliano is one of five active players on the list but the only one whose iron-man streak began at the start of his career. To continue his streak, he doesn’t simply play easy minutes. As a member of Anaheim’s second line, he plays alongside Ryan Kesler and Jakob Silfverberg to shut down the opponent’s top line. Because of this, he is an important member of the team’s penalty kill and led the team in shorthanded goals with three. He played 15:08 per game, much less than both of his linemates. Silfverberg played 18:29, while Kesler clocked in at 21:18 to lead all forwards. At 5 feet, 10 inches and 184 pounds, Cogliano’s small stature may help him continue his iron-man streak. After all, he’s known for being one of the faster Ducks, which makes it difficult for larger opponents to lay a large hit on him. This year, Cogliano made his case for the Masterton Trophy by surpassing Craig Ramsay for the fourth spot on the list. In March, he played in his 777th game, ironically against the team that drafted him and gave him the chance to begin his iron man streak, the Edmonton Oilers. After a stellar training camp, he earned himself a spot on the Oilers’ opening night roster in 2007. He then stayed with the team for the entirety of his rookie season. He finished the 2016-17 season with a 786-game iron-man streak, the longest streak of anyone in the four major sports. At 964 games, Doug Jarvis holds the top spot on the list. If Cogliano continues playing 82 games a season, it would take two more seasons and 15 more games to break Jarvis’s record. It is a feat that is certainly possible as Cogliano will only be 33 years old. Never missing a single game certainly exemplifies perseverance and dedication, but coming into Wednesday night, Cogliano wasn’t even the favorite to win the Masterton. 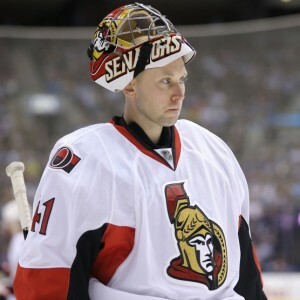 Instead, the award went to Ottawa Senators goaltender Craig Anderson. In October, Anderson’s wife Nicholle was diagnosed with a rare form of throat cancer. Despite taking several games off to be by her side, including a two-month stretch, he played 40 games the past season and finished with a 25-11-4 record coupled with a 2.28 goals-against average and a .926 save percentage. He also posted five shutouts, including a memorable one against the Oilers. Late in October, Senators backup goaltender Andrew Hammond had sustained a lower-body injury. Selflessly, Nicholle told Anderson that the team needed him. The next game against the Oilers, Anderson made 37 saves to shut them out. During the postseason, Anderson returned full-time and won 11 games to help the Senators reach the Conference Final for the first time since 2006-07. On May 25, Nicholle was declared cancer-free. After going through this experience, it’s no wonder Anderson was given the Masterton this year. Being able to concentrate through a 60-minute game while his mind must have been with his wife was a difficult experience for the 35-year-old goaltender. Yet, sometime during Cogliano’s career, he must be given the Masterton. Not only is he a hard-worker, but it is a remarkable feat for a hockey player to play in every game of his career, let alone in every game of the season. 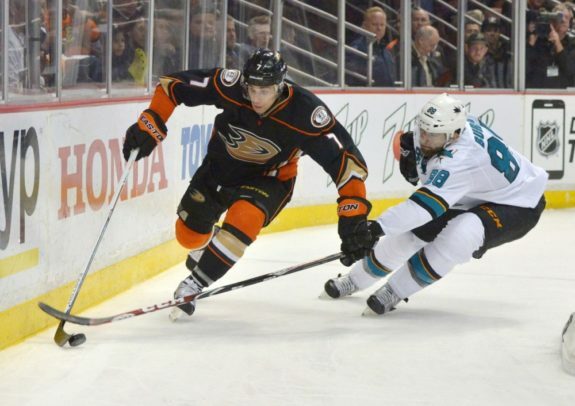 On the Ducks, only four players, including Cogliano, were in the line-up for every game. But, it isn’t as though Cogliano has never been injured. Back in 2013, Blackhawks forward Brandon Bollig hit Cogliano in the mouth with a high stick. It went uncalled as Cogliano skated off the ice, his mouth filled with blood. After losing a couple of teeth, Cogliano returned to the ice and didn’t miss a single shift. If that’s not dedication to hockey, what is? Cogliano shows his dedication to hockey every night he’s on the ice and every day that he’s not. He goes through a meticulous stretching routine and is very careful about what he eats. One year, Cogliano will have to be rewarded for his dedication, but until then, he’ll just have to continue climbing up the all-time iron-man list and perhaps, make history.